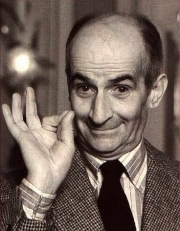 Louis Germain David de Funès de Galarza (; 31 July 1914 &ndash; 27 January 1983) was a very popular French actor who is one of the giants of French comedy alongside André Bourvil and Fernandel. His acting style is remembered for its high energy performance, a wide range of facial expressions and an engaging, snappy impatience. He was enormously successful in several countries for many years, but remained almost unknown in the English-speaking world. He was only noted in the United States in 1974 with the release of The Mad Adventures of Rabbi Jacob. In a 1968 poll, he was voted France's favourite actor. In a personal statement, he claimed to be interested only in films that would draw an audience of at least 500,000. Louis de Funès was born in Courbevoie, Hauts-de-Seine to parents from Seville, Spain. His father, Carlos Luis de Funès de Galarza had been a lawyer in Spain, but became a diamond cutter upon arriving in France. His mother, Leonor Soto Reguera was of Spanish and Portuguese extraction. Since the couple's families opposed their marriage,they settled in France in 1904. Known to friends and intimates as "Fufu", de Funès spoke French, Spanish and English well. As a youth, he was fond of drawing and piano playing. He was an alumnus of the lycée Condorcet in Paris, a distinction he shared with Henri de Toulouse-Lautrec, Paul Valéry, Paul Verlaine, Marcel Proust, Jean Cocteau, Serge Gainsbourg, and Claude Lévi-Strauss amongst others. He later dropped out, and was not successful in his early life; as a youth and young adult, de Funès held modest jobs, from which he was repeatedly fired. He became a pianist, working mostly as a jazz pianist at Pigalle, famous for being a touristic red-light district. There he made his customers laugh each time he made a grimace. He studied acting for one year at the Simon acting school. There he made some useful contacts, including Daniel Gélin among others. In 1936, he married Germaine Louise Elodie Carroyer with whom he had one child, a son named Daniel; they were subsequently divorced in late 1942. During the occupation of Paris in the Second World War, he continued his piano studies at a music school, where he fell in love with a secretary, Jeanne Barthelémy de Maupassant, a grandniece of the famous author Guy de Maupassant. She had fallen in love with "the young man who played jazz like god"; they married in 1943 and remained together for forty years, until de Funès' death in 1983. They had two sons: Patrick and Olivier . Patrick became a doctor who now practices in Saint-Germain en Laye. Olivier became an actor for a brief while. He became known for the roles he had in his father's films (Les Grandes Vacances, Fantômas se déchaine, Le Grand Restaurant, Hibernatus are the most famous). At the time, he was an aviator for Air France Europe. Through the early 40's, Funès continued playing piano at clubs, thinking there wasn't much call for a short, balding, skinny actor. His wife and Daniel Gelin encouraged him until he managed to overcome his fear of rejection. His wife supported him in the most difficult moments, while helping him to efficiently manage his career. Whole or part of the information contained in this card come from the Wikipedia article "Louis de Funès", licensed under CC-BY-SA full list of contributors here.